Shopping is My Oxygen: Good Lunch? Bad Lunch? 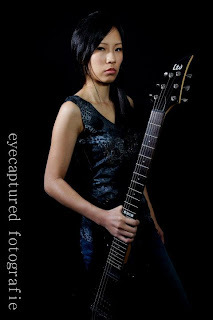 Received the photos from the electric guitar shoot. Do take a look here. Had lunch with bosses yesterday at Commonwealth Food Centre. The $4 seafood crispy egg noodle was one of the best I had. It was really crispy. As for today's lunch, was pathetic. Only had a hotdog bun and a lor mai kai. Only had 2 slices of cream roll for dinner now. My boss said I lost weight, indeed I had because I haven't been eating regularly like I used to. Probably have been overworked too. Was supposed to go for my dermatologist appointment this morning but decided not to. Why waste my money when I know the medication doesn't work on me? If my hair fall is serious, then I am just prepared to go bald. Looking forward to Saturday morning to try the samba costume for a photoshoot.